I was feeling nervous that morning, but I wasn’t sure why. I was getting ready to meet my boss in the lobby of the hotel he stayed in the night before. Being a sales rep meant having your manager ride along in your car with you about once a month. It was the same as any other morning I would meet with him before a day together, but I wasn’t feeling like myself. I walked in the lobby and sat down, waiting for him to come downstairs and meet me. When he did, he greeted me with his usual warm smile and he immediately put me at ease, as he does with most people he knows. Paul was one of the reasons I enjoyed my work at Merck – his management style was motivating and comforting. So when he sat down and said, “Seja, are you happy doing this work?,” I knew why I was feeling nervous earlier that morning. That was my last day with Merck. Up until the most recent few years of my life, I was pretty good at avoiding discomfort. I felt a wide range of emotions that morning – sadness, happiness, relief. I drove home that sunny morning after my resignation, I pulled in the driveway, and something, I feel, magical happened. It started to rain. It poured actually. There is about two hundred feet that separates the driveway from our trailer. It wasn’t showing signs of letting up, so I got out of the car and started to run to the house. But I was wearing heels. One came off in the mud. So I stopped. I just stopped and let the rain come down on me. I took a deep breath, put my one bare foot down in the wet grass, and felt the rain. I didn’t run from it. I stood there and let myself get soaked. And it was the most alive I had felt in a long time. That day was a changing point for me. It was the day I embraced feeling uncomfortable. It was the day that I realized that if I was feeling discomfort, it meant I was living and feeling all of it. He experienced the river that day. He felt all of it. And he showed me and our girls that if we want to feel all of life, we have to feel uncomfortable. We have to take the chance that it’s going to hurt. We have to sit in the front of the boat. What an amazing thing to live this life. And what a shame to be in it and not feel all of it. So I’m going to go running when it’s freezing outside, and relish the hot shower afterwards. I’m going to down the wheatgrass-kale juice, so I can be healthy longer. I’m going to play outside in the snow, when I’d rather stay in by the heater, and feel my toes go numb from the cold – and hold on to the memories of playing together while the girls let us. I’m going to take the risk in my business, because I would rather live and try it, than stay comfy and regret not trying. 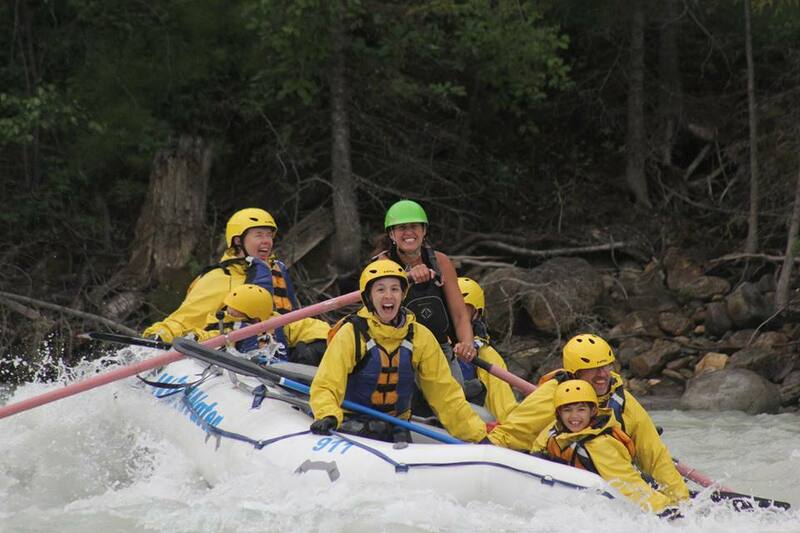 And if we ever go white-water rafting again, before the guide even says anything, I am going to raise my hand to be in the front of the boat. Thank you so much, Brandon! I loved this post enough to share it on our AFS Exchange Student webpage. I encourage them to really “live and feel” while they are here for the year on exchange. Don’t look back and say …i wish i would have tried this or done that. Thank you so much, Erin!! !